US - I have been receiving numerous calls about low sow prices and if there is any relief in sight. My response has been, “You can count on death, taxes, and poor sow prices in December!“ Demand and holidays interfere, so in return sow processors cut their kill numbers, writes Alan Bentley, Genesus. I am hearing bids on boars this week of 1 cent and sows around 10 cents per pound. The good news is that market always seems to improve as we head into February and March. Many people charge for marketing advice, but if I could offer some free advice, stockpile your cull sows for 6- 8 weeks and there is a good chance you will double your money, and at these low prices maybe triple them this season. I understand that is not always possible, but if it is, it will be worth the wait. 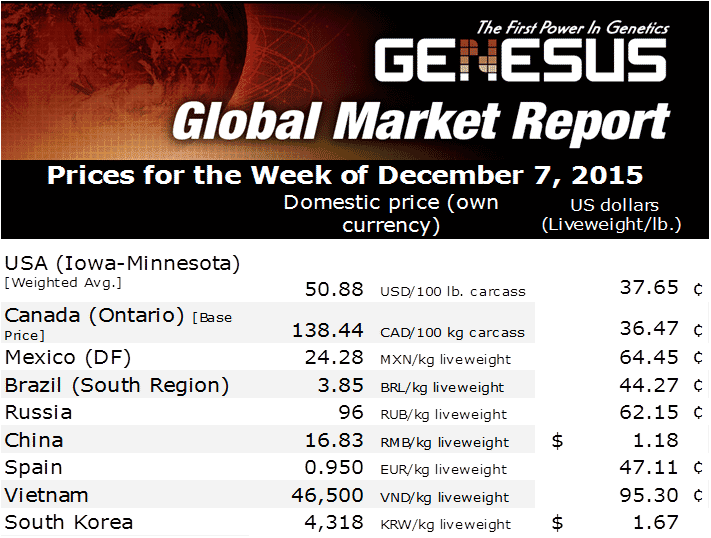 Historically December has never been a good time to sell cull sows. If you can hold on to cull sows, it is extremely important when you decide to sell, to get the sow processors the exact product they want. Size and condition means a lot but each processor has different needs. Sending the wrong weight or condition of sow to the wrong packer will cost you money. Working with a dealer will give you the ability to send the correct weight and condition of sow to the packers that will pay you the highest dollar amount for your product. I have seen cases of producers sending sows directly to plants and getting no value for animals that would have had a value if sent to the right processor. Many times, we think that dealing directly with a sow processor will make us more money but that is not always the case. In the perfect world we would have a gathering point and sort all the sows, send the processors the exact product they are looking for and every producer would get the best price for their sows. In our business, we are always trying to add value to our product, getting the right sow to the right processor is a great way to accomplish this.